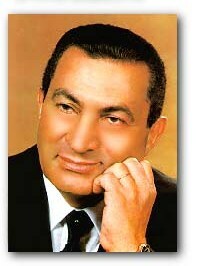 Hosni Mubarak was born Mohamed Hosni Sayed Mubarak. He was born on 04 May 1928 and was the 4th president of Egypt (October 14, 1981 February 11, 2011). The future president of Egypt was born on May 4, 1928, in the rural village of Kafr El Meselha, in the Menufiya Governorate. After having graduated from high school, Hosni Mubarak enrolled in the Egyptian Military Academy. In 1949, he received a B.S. in Military Sciences. Joining the Air Force in February 1949, Mubarak became a pilot office on March 13, 1950. He also received a B.S. in Aviation Sciences. During the beginning of his career with the Air Force, Mubarak served in different units, including two years in a Spitfire Fire Squadron. Mubarak also spent some time as an instructor at the academy, and remained so until 1959. In 1959, Hosni Mubarak married Suzanne Mubarak, and had two songs with her: Alaa and Gamal. From February 1959 to June 1961, Mubarak was trained in the Soviet Union, attending pilot trainings in Moscow and Kyrgyzstan. He also joined the Frunze Military Academy in 1964. Upon his arrival back in Egypt, Mubarak took command of the Cairo West Air Base. In 1967, Mubarak was appointed Air Force Academy Commander and then Chief of Staff for the Egyptian Air Force in 1969. His rise to power continued from there when he became the Commander of the Air Force, and Egyptian Deputy Minister of Defense. In 1973, Mubarak was promoted to Air Chief Marshall as a sign of appreciation and recognition of his service during the October 1973 War. In 1975, Mubarak was made Vice President of Egypt by then President Anwar El Sadat. In his capacity as Vice President, Mubarak helped with the agreement for the disengagement of forces with Israel. Mubarak also attempted to convince the Saudi and Syrian governments to also sign the same agreement with Israel, though the Syrian President refused to meet him. He also became a key participant in many foreign meetings. When President Sadat was assassinated in 1981, Hosni Mubarak rose to the title of the 4th This title also made him the Chairman of the National Democratic Party. Mubarak served for 29 years, the longest of any of Egypts presidents. President of Egypt. During his reign as president, Egypt was re-admitted to the Arab League (after having been suspended due to its peace treaty with Israel). Egypt was also part of the allied coalition during the Gulf War in 1991. Hosni Mubarak was quite vocal in denouncing the war in Iraq in 2003. In 2004, Prime Minister Atef Ebeid resigned, as did most of the cabinet. As a result, Mubarak appointed Ahmed Nazif as the new Prime Minister. Though it was viewed with optimism at first, after a while, this new government came under much scrutiny since many problems, such as unemployment, persisted. Though a vote is undertaken every 6 years, Honsi Mubarak has always won, though there has always been much controversy since it was widely believed that the elections were rigged. In 2005, a multi-candidate election was held, but Mubarak still won, and a political competitor, Ayman Nour, contested the results. As a result, he was jailed for forgery and sentenced to 5 years of hard labor. During Mubaraks terms, there was widespread government corruption. As a result of the corruption, and the emergency law in place, the Egyptian people had grown tired of the abuses by the police, and on January 25, 2011, staged a popular revolt. After 18 days of protests, Hosni Mubarak resigned from the post of president. On February 11, 2011, power was handed over to the Egyptian Military. Hosni Mubarak then escaped to a villa in the resort city of Sharm El Sheikh, and is currently being questioned on charges of corruption.